In 1926, Mother Angeline was appointed Superior of a Home of the Little Sisters of the Poor in the Bronx, New York. During an annual retreat in 1927, she felt an urge to reach out to do more for the aged for whom she cared. She felt that the European way and many of the customs in France did not meet the needs or customs of America. She also felt that old age strikes all classes of people, leaving them alone and frightened. Being unable to effect any necessary changes in her present situation, Mother Angeline sought advice and counsel from Patrick Cardinal Hayes of New York. Not only did he encourage her, but he likewise felt more could be done for the aged people in the New York area. Eventually, this need was recognized in the United States. In order to accomplish what she felt called to do, and with the blessing of the Cardinal, Mother Angeline and six other Sisters withdrew from the Congregation of the Little Sisters of the Poor and were granted permission from Rome to begin a new Community for the care of the aged incorporating Mother Angeline’s ideals. On January 21, 1984, Mother Angeline Teresa the Foundress, went to her eternal reward. She had the great consolation of seeing the Congregation beyond her expectations. Her daughters in Carmel remember her by her famous words: “If you must fail, let it be on the side of kindness. Be kinder than kindness itself to the old people.” Mother Angeline Teresa is laid to rest in the Congregation’s cemetery at St. Teresa’s Motherhouse in Germantown, New York. On June 28, 2012, His Holiness, Pope Benedict XVI, authorized the Promulgation of the Decree of Heroic Virtues. She is now known as Venerable Mary Angeline Teresa, O.Carm. Birth; second child of Thomas and Brigid Taggart McCrory. Struggles to adapt the Home to a more comfortable American lifestyle. Superiors in France do not approve new ideas. 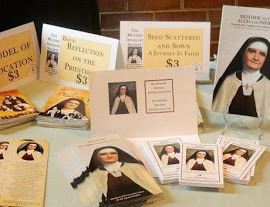 Dominican sisters helped them make. Avila on the Hudson, Motherhouse blessed. Sacred Congregation of Religious approves Order.